This custom house was built for a World Resources Institute board member, Todd and Melissa Thomson, by Dan Joseph Architects. That nature you see surrounding the custom built home is the countryside of near Yellowstone National Park. 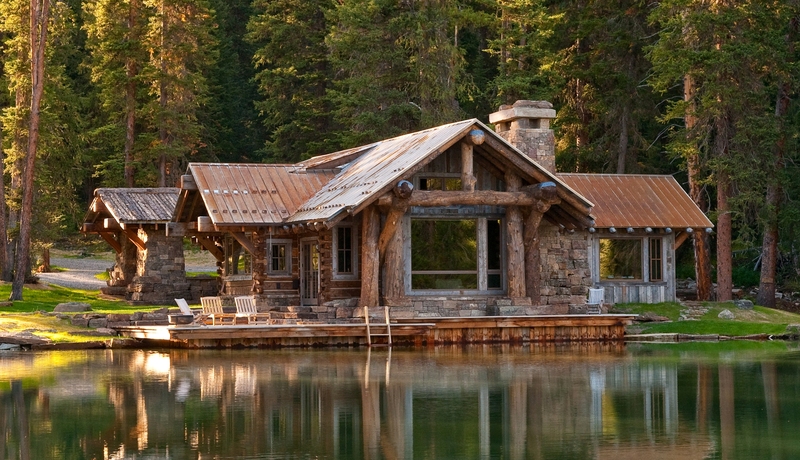 The custom cabin is called “Headwaters Camp” — the style of it I mean — was recognized by the US Green Building Council for its environmental and sustainability features — the third house in Montana to get the Platinum certification. In building this custom house, the Thomsons also worked with Highline Partners and Kath Williams and Associates, besides DJA, all working toward, in addition to other goals such as architectural aesthetics and comfort, innovation in minimizing effects of a house on the environment around it. They did this by — Dan Joseph Architects part — designing with efficient materials and building in mind. They used local and reclaimed construction materials, cut down on the wastes often associated with building a house, and used modern energy-reducing home technologies (such as ground-source heat pumps, on-demand water heating, special insulation, windows that were triple glazed, passive solar considerations, dual flush toilets, and more. “Carefully blending a world defined by orderly needs of program and the random artistry of nature in the extreme” is the moto of (click here), who operate out of Big Sky, Montana and Jackson Hole, Wyoming.